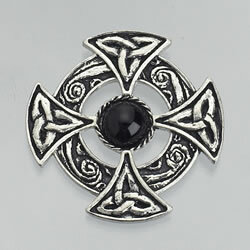 Pewter brooch with four triquetra set as a cross, with 8mm semi-precious stone in the centre. The item illustrated is set with black onyx, and is also available set with a variety of other stones. 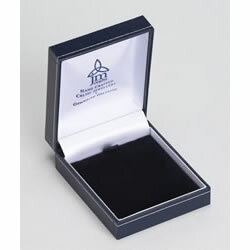 The brooch is supplied in a leatherette gift box (as shown below).